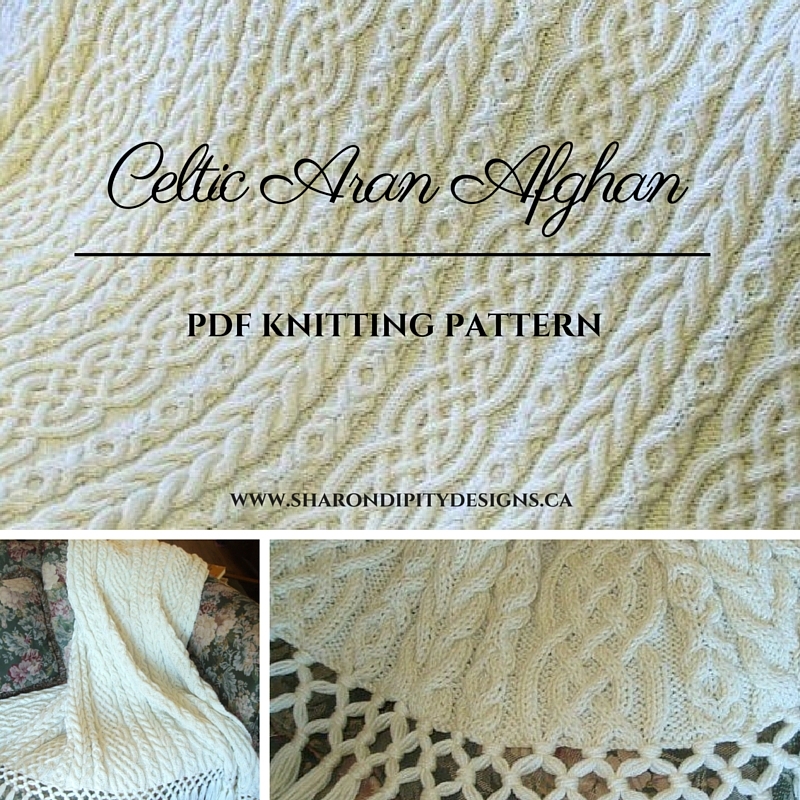 This is the ''Irish'' Afghan I designed while planning a trip to Ireland! It is made up of 5 panels that are 12'' wide x 72'' long and seamed together. Each panel has a large Celtic Braid running up the center and columns of Hugs and Kisses (X's and O's) on either side of it with regular cables running up each outer edge. It is finished with a Triple Knot fringe. Included with the 3 page pattern are easy to follow instructions to guide you from beginning to end including materials, pattern and finishing instructions, as well as photographs. 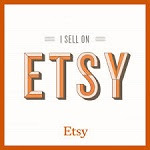 You can purchase the PDF file of this pattern directly from here via PayPal and it will be emailed to you OR you can purchase the pattern from any of the following sites for immediate download: Etsy, Craftsy or Ravelry! Dainty and delicate, a beautiful combination of lace and cables! Finished Scarf measures 8'' wide by 72'' long with an additional 5" of fringe on each end. The pattern for this scarf is available to purchase for immediate download for $5.00 USD from my shops on Etsy and Ravelry. You will receive a PDF file with complete knitting and finishing instructions, stitch explanations, fringe instructions and photos. 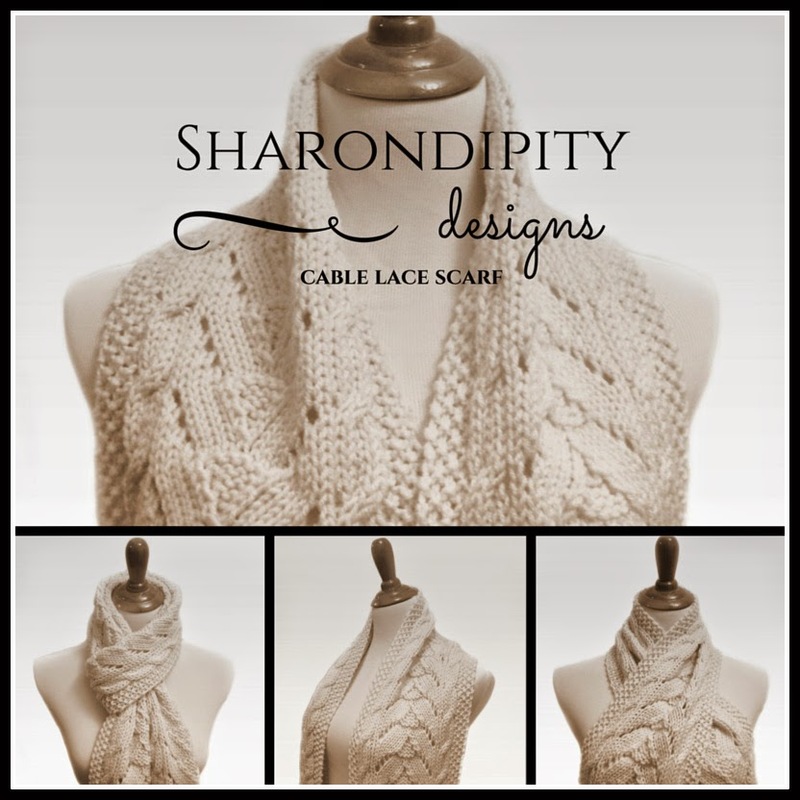 Pattern may not be reproduced or redistributed without the express written permission of Sharondipity Designs. A beautiful 12 stitch Plait times two!! Each plait is bordered with a slipped rib stitch to add dimension. Finished size is approximately 7'' wide by 60'' long. The pattern for this scarf is available to purchase for immediate download for $5.00 USD from my shops on Etsy & Ravelry. You will receive a 2 page PDF file with complete knitting and finishing instructions, stitch explanations, fringe instructions and photos. 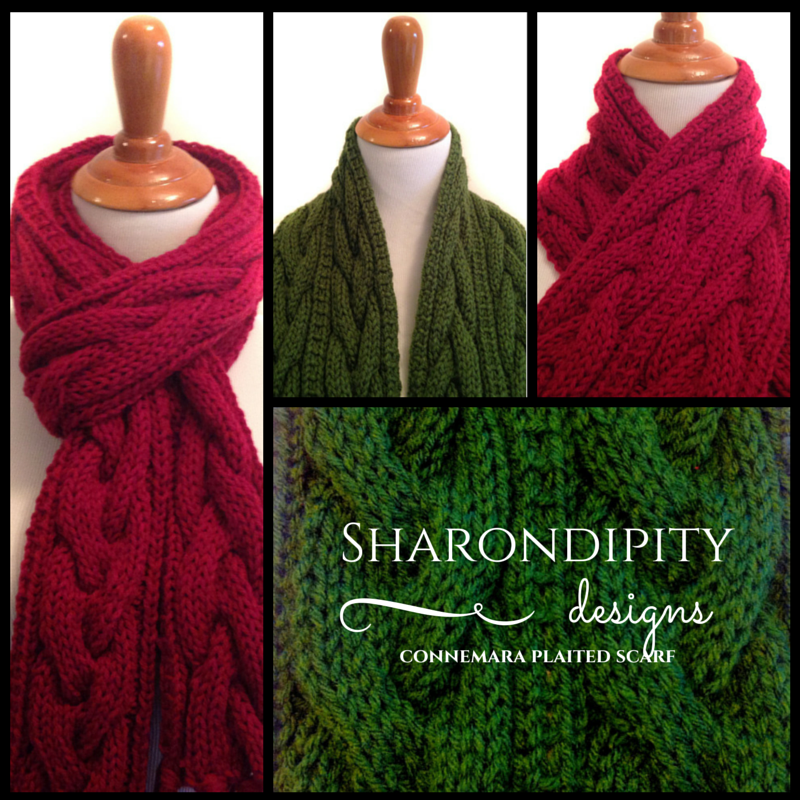 This winter season keep you and yours toasty warm with this beautiful Cable Knit Scarf from Sharondipity Designs. 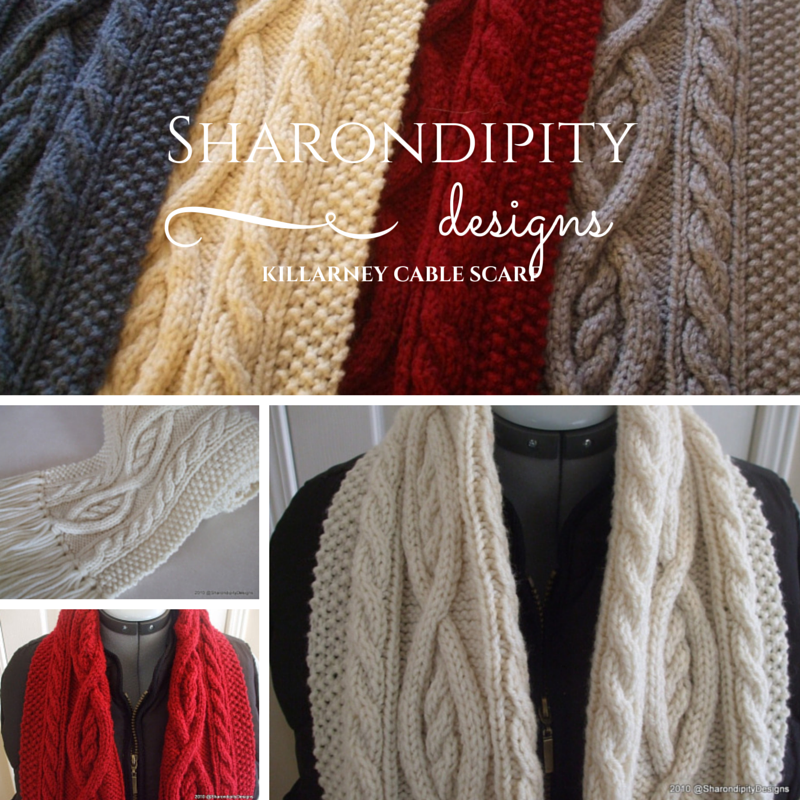 Handcrafted in the traditional Irish twisted cable knit style with thick comfort yarn. Scarf measures 8" wide by 70" long with an additional 5" of fringe on each end. The pattern for this scarf is available to purchase for immediate download for $5.00 USD from my shops on Etsy and Ravelry. You will receive a 2 page PDF file with complete knitting and finishing instructions, stitch explanations, fringe instructions and photos.